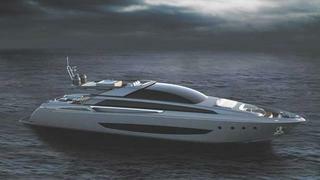 Italian builder Riva has announced plans to move into the superyacht arena with the build of the 122 Mythos, its largest motor yacht yet. The Ancona-based yard CRN, which is also part of the Feretti group and built Riva’s large yachts in the 1950s and 1960s, will construct the 37m boat. Apart from its record size, the triple deck Mythos will also be the first aluminium boat from the 170-year-old Riva yard, which established its reputation with classic wooden sports boats, later moving on to stylish sports cruisers and motor yachts. The beautiful lines of the Mythos have been developed by Mauro Micheli of Officina Italiana Design, who designed the whole of the current range of Rivas, working closely with Ferretti’s Advanced Yacht Design team. Mythos features lower deck cabins, a large saloon at main deck level, a flybridge and there are three possible layouts, with three, four or five cabins according to the owner’s request. It will be powered by a pair of MTU diesels from the 4000 Series and have a top speed of 27 knots and a cruising speed of 25 knots.